When you cycle in to the office, if you’re a gentleman who is proud of the hair on top of his head, the choice of helmet can be tough. Not only does wearing a helmet squash your tidy hair do, it also traps in the heat, making your head sweaty, further endangering what you’ve just spent a good half hour preening. For a lady who has longer hair, the challenge can be doubled, more hair equals more heat. That’s a mathematical equation which will have you scratching your follicles over which helmet to buy and why. The answer, of course, isn’t not to wear one, if you’re on a bike you need a helmet. The answer is getting the right one. It needs to look good, be light weight, breathable and if possible be able to enhance your hair do – side note, no helmet will enhance your hair style. 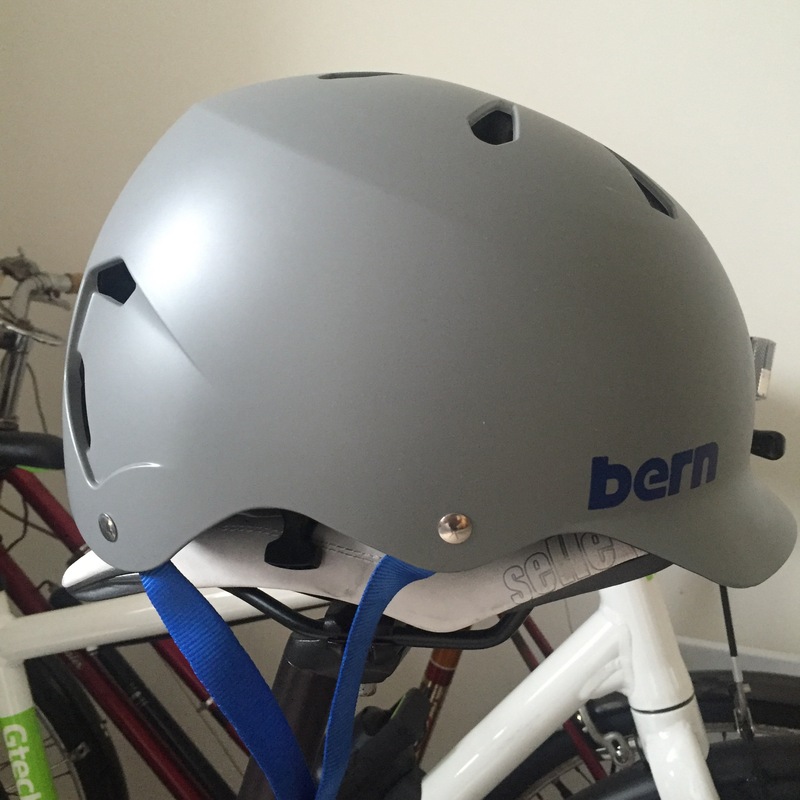 I’ve been very lucky, because the chaps at Bern sent me over their best-selling commuter helmet,the Bern Watts. So over the next few paragraphs I’m going to proceed to tell you about it. I’ve heard (or not heard) of Bern, why are they so popular? It’s easy to see why so many people like the Bern helmet, its got simple style, it’s very functional and it doesn’t empty your bank balance or compromise on function over form. What’s so good about this helmet then? What’s more, it’s lightweight because it’s a thinSHELL, meaning protection is not compromised as weight it dropped. 460 grams this helmet weights, just a shade over a pound in weight, or a bag of sugar. There’s that thinSHELL label and the dial at the back helps you adjust the size. It also means that the helmet is no bigger than it needs to be, so you don’t look like you have a huge eight ball on top of your head as you cycle down the street. But weight is not all, the helmet is also well ventilated, reducing heat under your lid, reducing sweating and hopefully meaning you haven’t wasted that half an hour in front of the mirror this morning. The ventilation on this helmet makes it the perfect summer commuter helmet. The peak at the front of the helmet is not only stylish but helps keep the sun out your eyes and also the rain if the weather were to change. So it’s good for the summer, what about the winter? Well, funny you should ask that question, it’s almost as if I teed it up in the closing sentence of my previous paragraph. The good thing about the Bern helmet is that you can add a winter lining. No need to wear a wooly hat under your helmet as you can fix one securely in place on this helmet. So not only do you get a helmet for all four seasons but you can just pop the lining in and out when you feel it’s too cold on your top two inches. How much does it cost and is it worth it? Whether or not you’re willing to part with the cash depends on how much you value your life, or hair do. The Bern Watts costs £54.99 and for a helmet which you can wear for four seasons, that’s a right steal! Personally, I think it’s a right good price. I’d much rather spend the money on this than wear a £20 Bell helmet from five years ago. Why should I choose this one over the rest? As if I haven’t gushed over this helmet enough, jeeze. In short, the colour combinations are great, it’s functional, lightweight, not overly pricey and it suits the commuting style. The ventilation is enough to keep you cool but not too much that if it were to rain you’d need an umbrella, not that they’re much use when you’re cycling anyway. I really do think it’s the perfect commuter helmet, from the moment you put it on, it just feels right.